H-F teacher B.J. Engrav prepares to lead members of the Viking Orchestra during the Jan. 20 auction to raise funds for the orchestra's trip to Germany over spring break. Lara Elfner of Homewood places a bid on H-F sportswear. 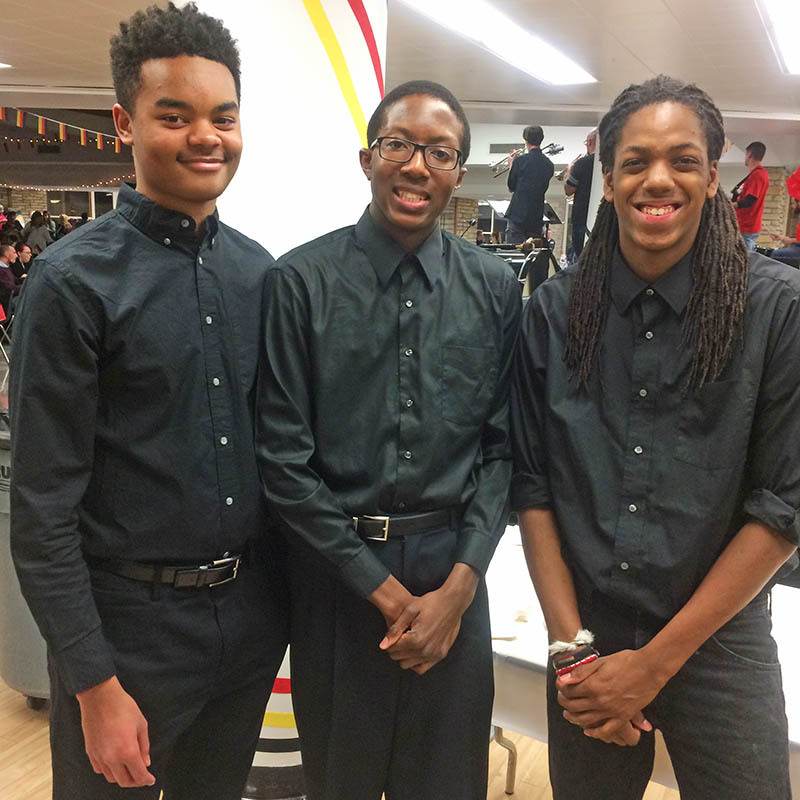 Ready for their trip to Germany are, from left, cellists Caleb Hoereth and Nicholas Amuh and bassist Andreu Mason. A host of volunteers, including from left, Julie Lawton, Tracy Weems and Kenia Holley helped make the H-F auction a success. 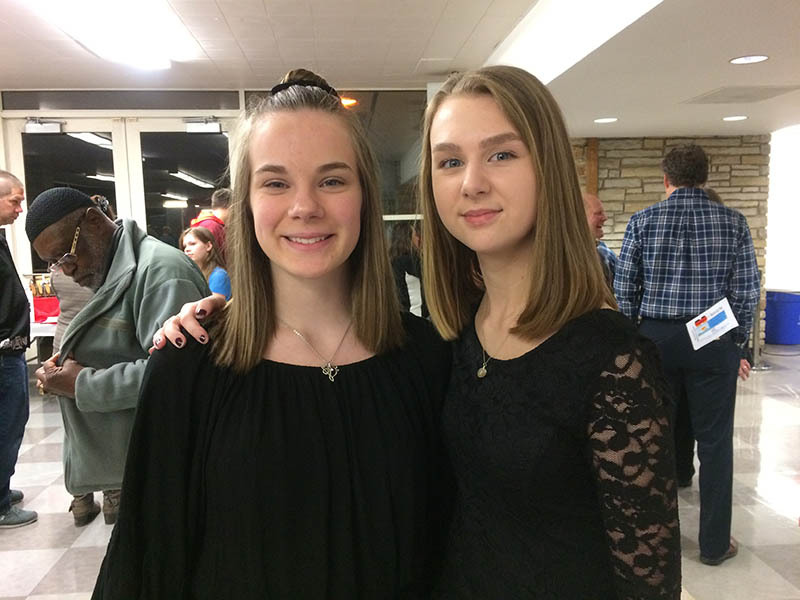 Ready to explore Germany are Viking Orchestra members cellist Lily Knetl, left, and clarinetist Anna Gsell. 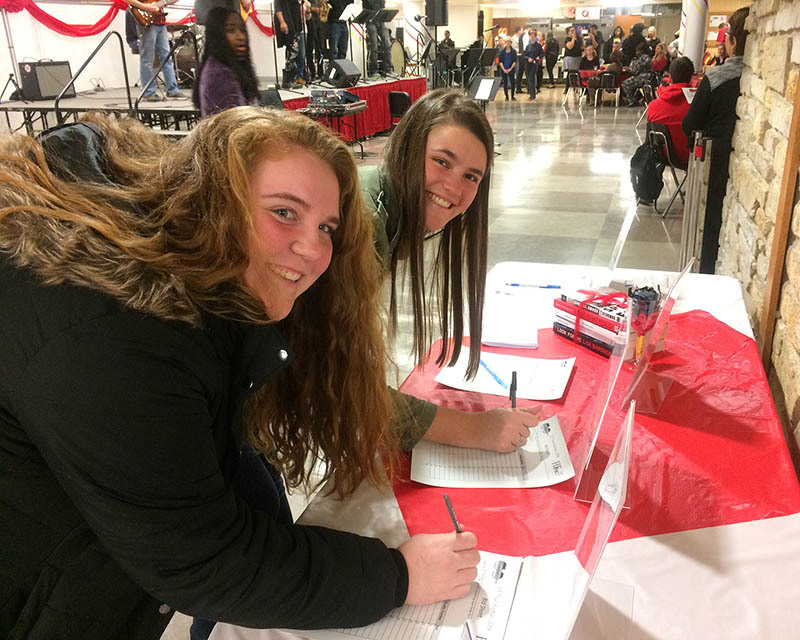 Placing their bids are Kacie Schmidt, left, and Jullian Lessner. 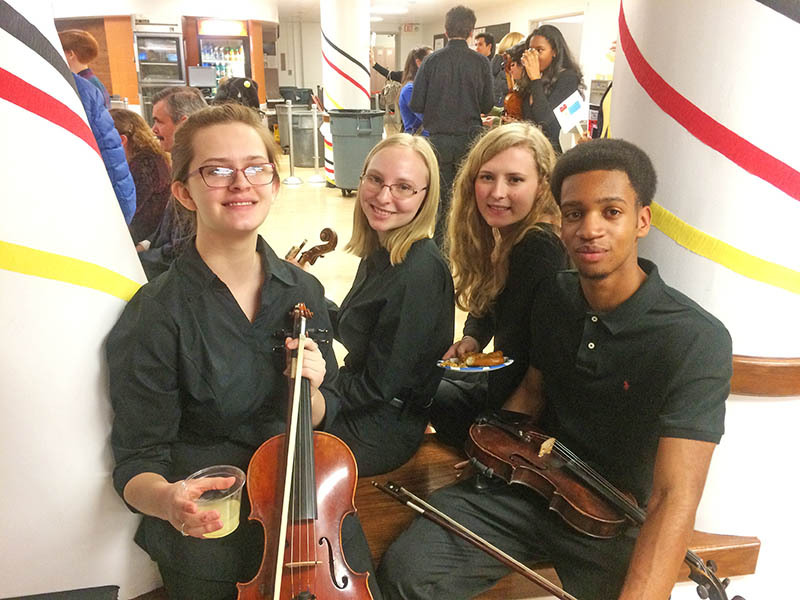 Musicians, from left, Emma Anderson, Allie Mangel, Tara Thrall and Ryan Cox enjoyed the evening. 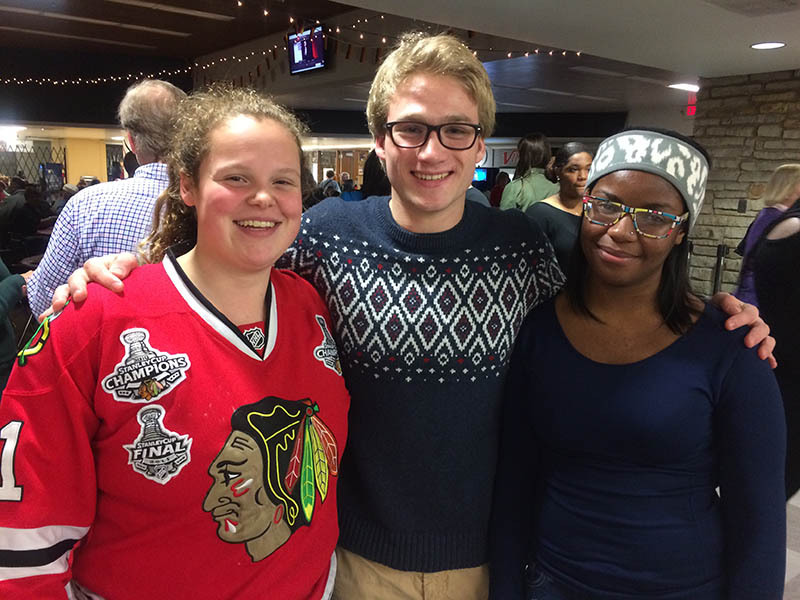 Student supporters at the H-F auction are, from left, Kylie Andersen, Max Dunlavy and Morgan Moore. 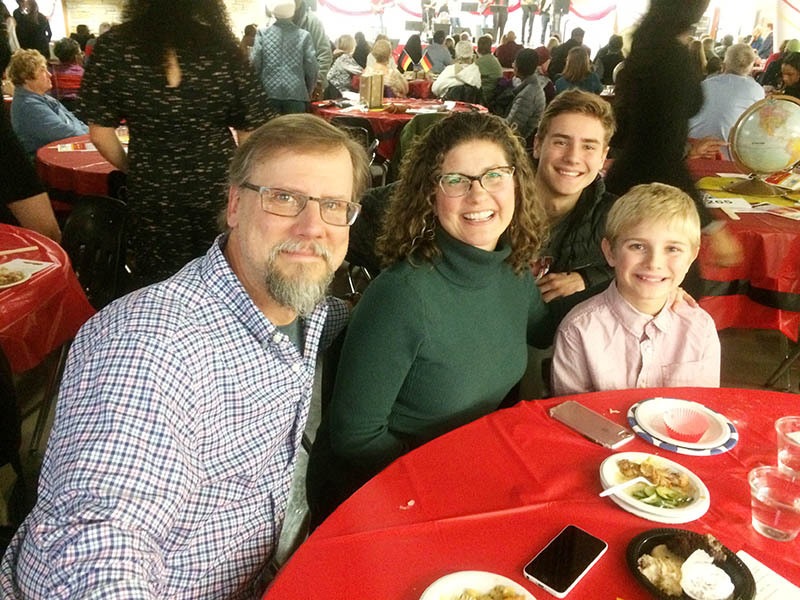 The Piotrowski family of Homewood, from left, John, Jenny, Matt and Nick, were enjoying the evening. 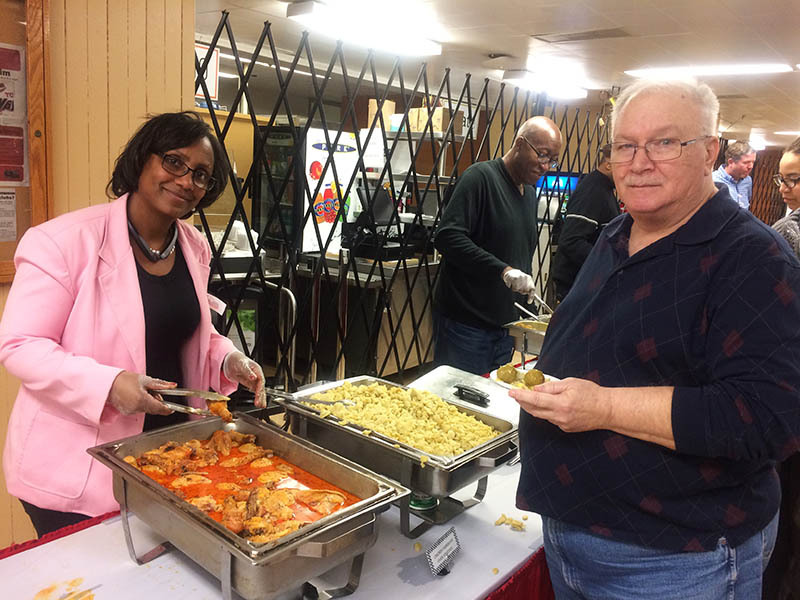 Toya Harvey serves a German specialty to Mickey Rusek of Park Forest who came to support his granddaughter, Rachel Rusek, who plays violin with the Viking orchestra. 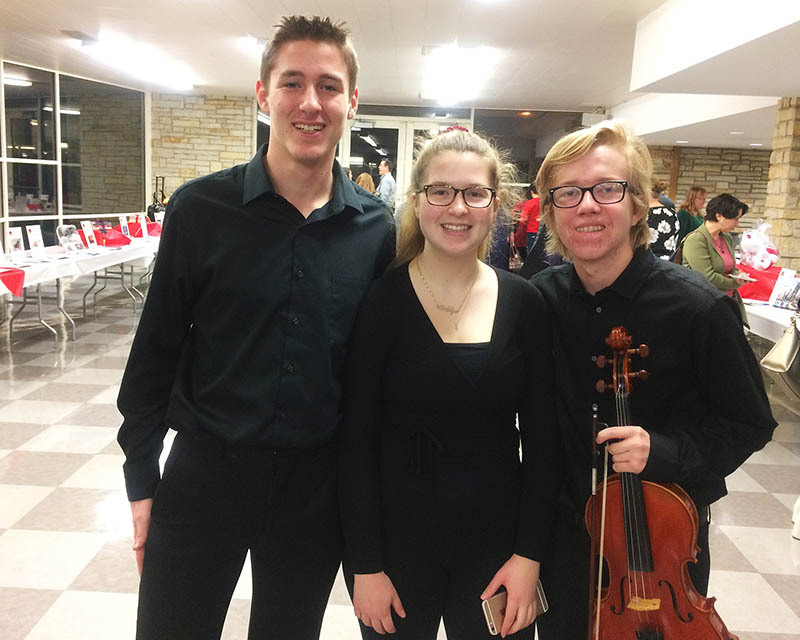 Musicians, from left, violinists Bradley Coen and Madelyn Fitzgerald and violin player Perry Hoag took a break to look over auction items. 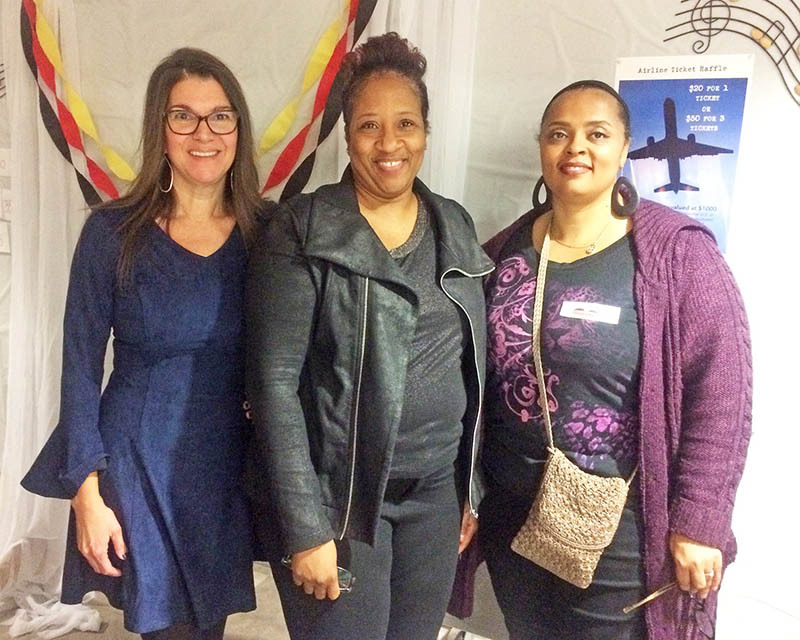 Coming out to support musician Ryan Cox are, from left, Jacqueline Clark, Camille Crawford and Penny Lee-Cox. 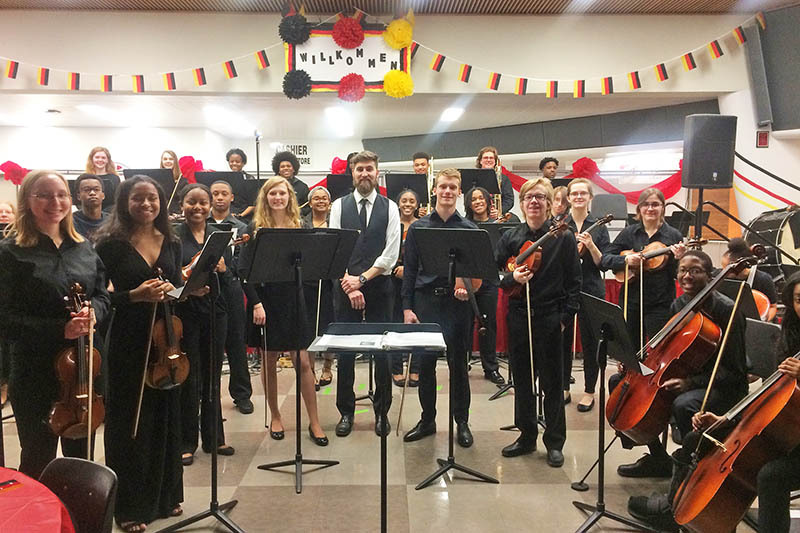 The community came out for a good time on Saturday, Jan. 20, and to offer support for the Homewood-Flossmoor High School Viking Orchestra and Symphonia Orchestra as students prepare for their trip to Germany. 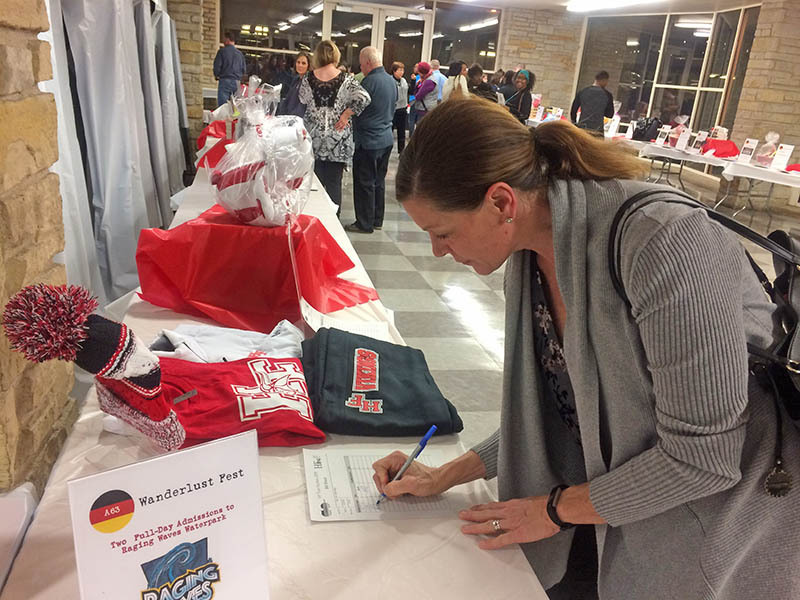 A live and silent auction helped raise funds to cover a portion of the cost for the students. 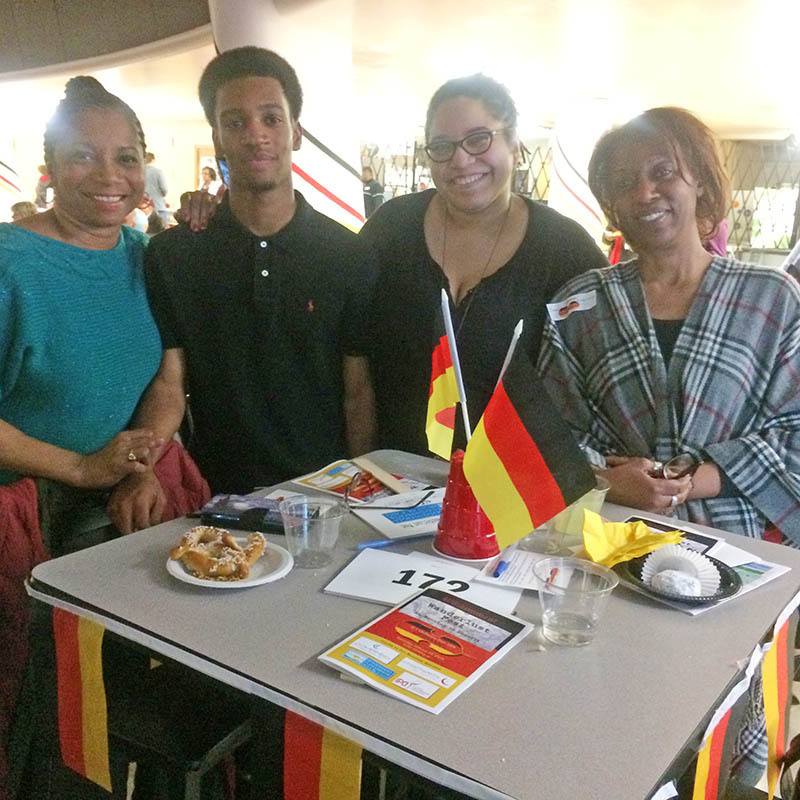 Guests enjoyed a selection of German foods and desserts. The orchestra played several selections, and the band Staff Infection, made up of H-F teachers, also took the stage. The student musicians, under the direction of teacher B.J. Engrav, will perform in Potsdam, Brandenburg in the Berlin region and Pegau, a city in the Leipzig district. They will have workshops and exchange opportunities in Leipzig. Musicians on this trip are Julian Allen, Nathan Amuh, Nicholas Amuh, Emma Anderson, Cora Anderson, Cameron Barton, Ethan Bosch, Jania Breland, Brianna Bridges, Anton Brooks, Alexa Brown. Kevin Cawley, Bradley Coen, Ryan Cox, Shelby Crook, Kyndall Davis, Faith Denne, Rorie Dougherty, Uriah Elliott, Madelyn Fitzgerald, Eli Gonzalez, Anna Gsell, Abigail Guerrero. Aaliyah Hall, Philip Robb Hallman, Olivia Hamer, Taylor Harvey, Alannah Hill, Perry Hoag, Caleb Hoereth, Lillian Knetl. Kira Lavizzo, Will Lawton, Allie Mangel, Chad Martin, Andreu Mason, Camela Moore, Anna Moran, Russell Oram, Lucas Rappatta, Sean Roby, Rachael Rusek, Tyrone Simpson, Luca Strohmeier, Tara Thrall, Arthur Willis, John (Ben) Wootton. The H-F Orchestra trip is sponsored by the Homewood-Flossmoor Fine and Performing Arts Council (HFFPAC), an independent organization that supports local youth music programs, and HF Orchestra Parents United in Service, a volunteer organization dedicated to supporting the H-F High School orchestra program. Photos by Marilyn Thomas/H-F Chronicle.